Every once in a while, you hear about some tunnels that lead from some old manor house to a nearby church or somesuch. More often than not, it’s complete hogwash but near Telford Shopping Centre there is such a tunnel. The tunnel leads between two office buildings. 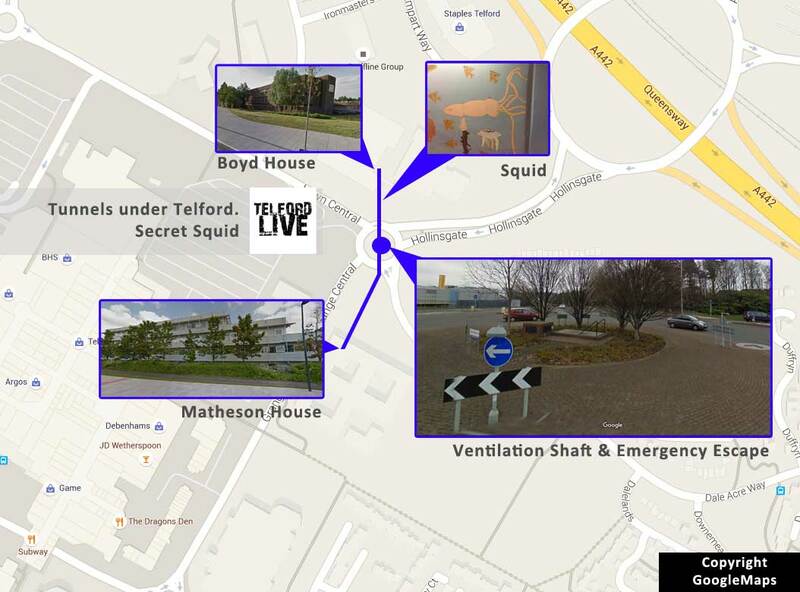 Matheson House and Boyd House, both places are HMRC buildings and pedestrian traffic between the two is made easier with a private underground tunnel. 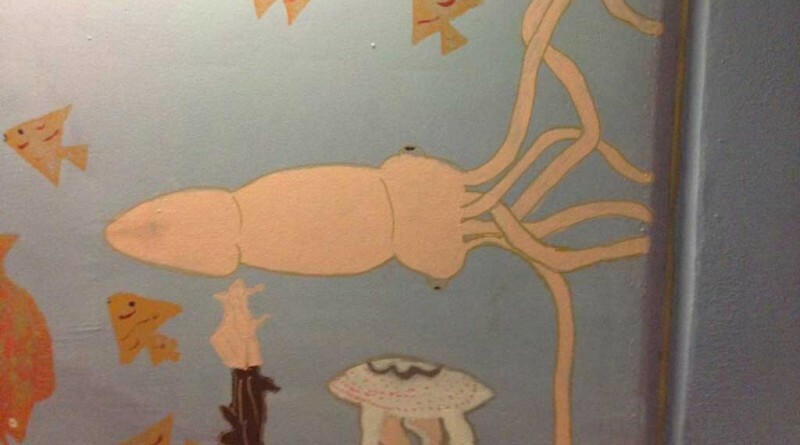 We know this exists because the tunnel has developed its own folklore, with a mural underground that is said to feature a squid/jellyfish combination painted by Woodside schoolchildren in the late 90s as part of a mural that graces its entire length. In a recent post on Facebook, Vicky Pilsbury shared that she broke her foot in there (yet still hobbled to her meeting before going to A&E) and on one online forum, an ex-contractor mentioned that the tunnel ‘used to be used by one of our problem managers to meet his ‘ special friend’ and was marched out of the office when found out. Because of the work that goes on in these offices, photography is strictly prohibited, but I needed to share the secret squid with the rest of the world, just like the secret mural that lived in the Ironbridge Power Station that closed recently, along with more Telford public art before it is lost to world. Thanks some kind-hearted soul, after a few days, I was anonymously sent a photograph of the Squid, which in all fairness could have even been a jellyfish, or something else. Whatever it is, I’m delighted to have been able to share yet another piece of not so public art with you.